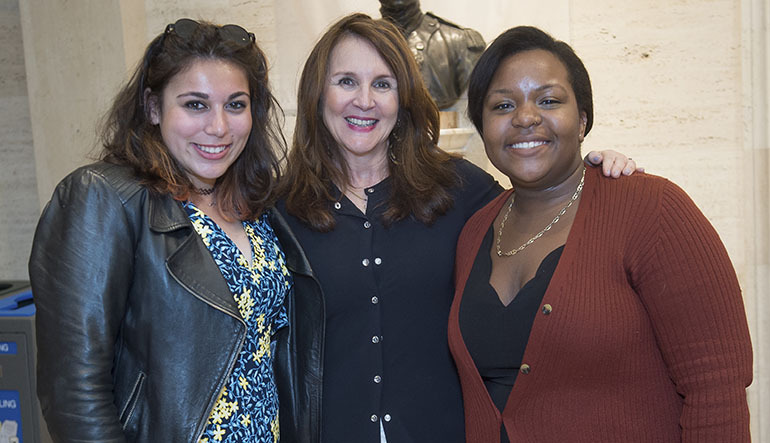 Acclaimed poet Jill Bialosky (center) judged the College’s annual H. MacKnight Black Competition. Kenzie Corbin ’18 (far left) and Ashley St. John ’18 (far right) were both named winners. It was the reading that culminates in the H. MacKnight Black Competition, the College’s 67-year-old poetry contest. 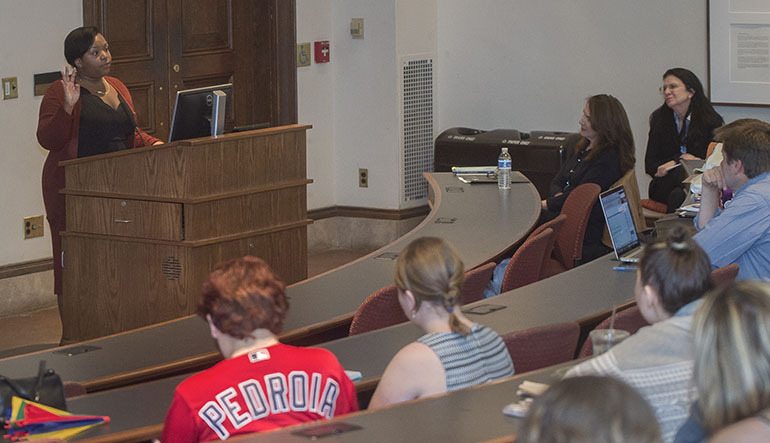 The pride of Lafayette’s English department, the competition in recent years has been judged by a distinguished poet, like Bialosky, who, in addition to sifting through entries, visits campus and sits down to chat with students. Proof of Bialosky’s assertion of poetry’s health can be found in the co-winners of the contest. Kenzie Corbin ’18, whose poem “Identity Crisis” won, is a neuroscience and French double major with a minor in bioengineering. Ashley St. John ’18, who won for “First Generation,” is a neuroscience major. Neither winner is anticipating a career in letters. Nor do they view their writing as ancillary; poetry is a lens through which they view the world. It’s the way they process everything. St. John also came to verse as a way to express emotion. “I was a very emotional kid and even more as a high schooler,” she says. At Lafayette, she focused her energy entirely on neuroscience, until during her senior year she took Poetry Writing Workshop with Assistant Professor of English Megan Fernandes. The writing prompts rekindled the poet within her. Both winning poems are about identity. Both have conversations with external forces before taking defiant turns inward. The emotional heft of St. John’s short lines pulls the reader to their devastating conclusion. Smatterings of conversation populate Corbin’s poem, and as she examines them our notions of identity are turned on their head. 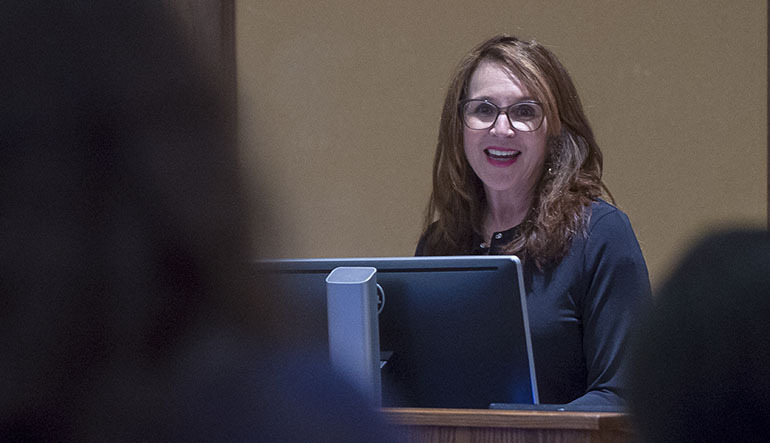 In addition to selecting the winning poems, Bialosky attended a question-and-answer session, where students asked the author about her process, how she switches among her various genres, and how she selects work for publication when serving as an editor. Tapping a prestigious author to select the winners began in the 1990s. The competition launched in 1950, named for H. MacKnight Black 1916, who had become an important poet before his death in 1931. Writers such as Paul Muldoon, Matthew Dickman, Major Jackson, Kimiko Hahn, Heather McHugh, and Lynn Emanuel have served as judges. Bialosky is author of four poetry collections, most recently The Players, and three novels, as well as two memoirs: History of a Suicide: My Sister’s Unfinished Life, and the recently released Poetry Will Save Your Life. Her poetry and essays have appeared widely, including in The New Yorker, Paris Review, The New Republic, and The Nation. She is an executive editor and vice president of the publishing company W.W. Norton. She has edited such esteemed poets as Adrienne Rich, Rita Dove, Eavan Boland, Major Jackson, and Cathy Park Hong. In addition to a cluster of poems, Bialosky read from her memoir Poetry Will Save Your Life. The excerpt included the story of how as a young girl the work of Robert Frost spoke to her. In the audience, though she plans a career that doesn’t involve writing poetry, Corbin carried in her cellphone the poems she knows may continue to save her life.